In this edition, Jordan is excited as Chadwick Kauffman has invited Vera Van Alst, Uncle Kev and her to a formal luncheon at his home Summerlea. Vera is buying pristine first editions of Ngaio Marsh. The next day Jordan and her friends’ lives came crashing down, as the police informed them that they are suspects in the murder of Chadwick. Uncle Kev disappears as the police arrive. The homicide inspector is harassing Jordan relentlessly. Her lawyer, Sammy C. arrives and puts a stop to the questioning. Smiley Tyler breaks their affair off by a text message. Jordan’s life continues to dismantle until she has nowhere to turn. Jordan must find answers to why this happening before Jordan and all of her friends are on trial. The ending well astonished you. It did me. 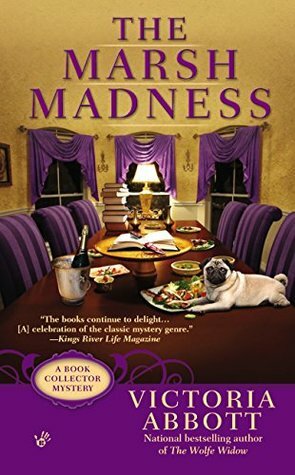 This entry was posted in Books and tagged cats, cozy mystery, Dog, facorite, Jordan, Victoria Abbott. Bookmark the permalink.